Are you a high rise dweller who is concerned about roaming cats in your corridor? Before you make a complaint to the authorities, here are some ideas and humane methods to deter and discourage these roaming cats from loitering near your home. Rub white vinegar, lemon juice, crushed mothballs or salt where the cat usually lingers. These ingredients are not harmful and will not hurt the cat or yourself but they will discourage loitering as cats dislike these scents. To deter a roaming cat from sleeping in your potted plants, place blunt disposable chopsticks around the pot to prevent the cat from climbing in. Ensure the sticks are blunt so as not to injure yourself, the cat or a passing neighbour. Using a small spray bottle, lightly squirt water on the cat whenever you see the cat outside your door. This will discourage the cat from loitering and visiting your home again. Please use cold water so you don’t hurt yourself or the cat. A roaming cat in the corridor may in fact be a pet cat and not a community cat. If you can identify the household that may be keeping this cat or feeding it upstairs, use our mediation advisories to advice the owner to do the right thing. Often, the spraying of urine is a territorial gesture by an unsterilised cat. If you would like to help this cat, do consider getting it sterilised. We provide sterilisation support through various programmes. 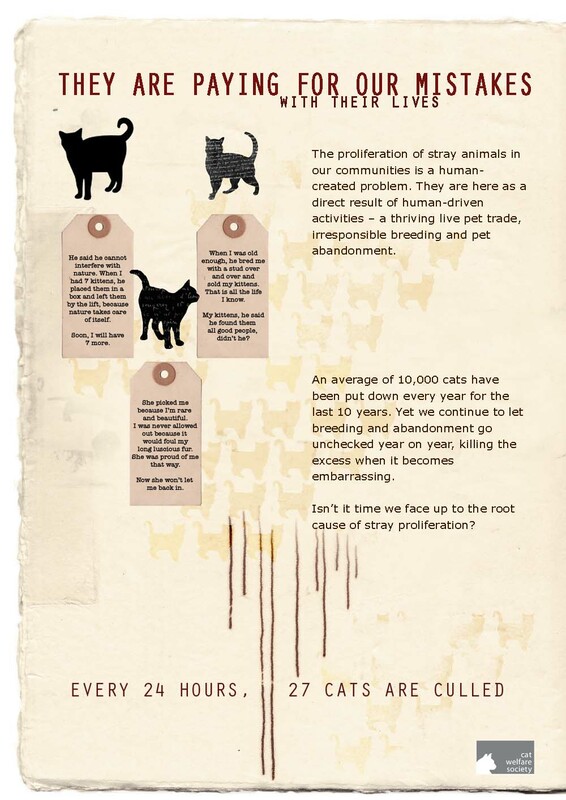 A sterilised cat will be tamer and less likely to roam. 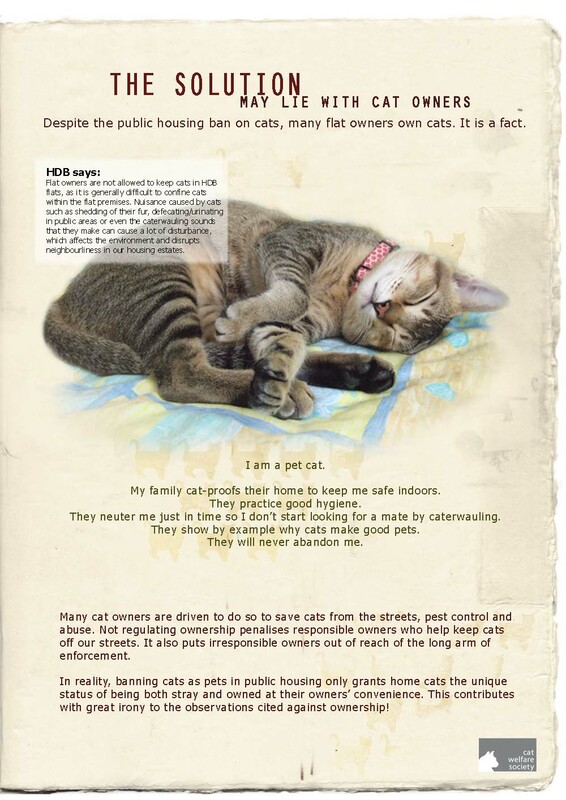 Are you a property owner or manager who is facing cat issues? 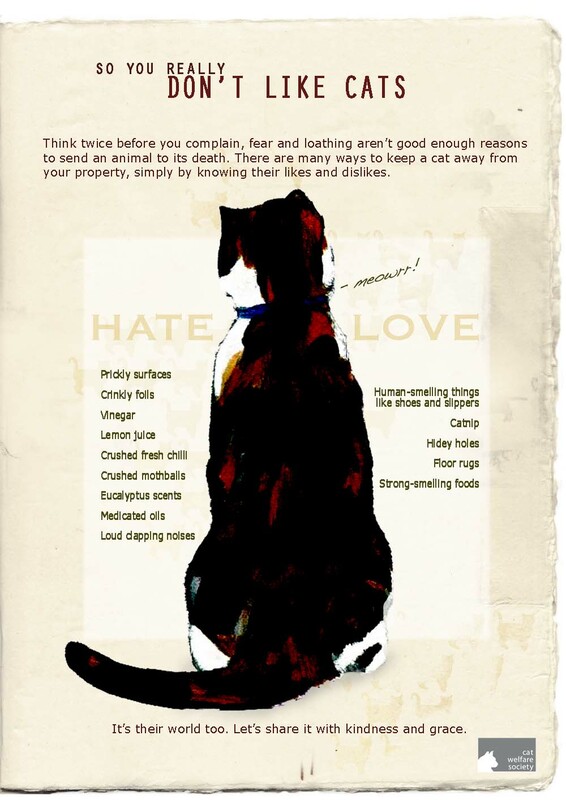 Some ways to deter cats from your property have been outlined above. We can also help you obtain a high-frequency sonic repellant that can be installed to deter cats. If your land area is a large one such as a condo or commercial compound, removal of cats is often not the solution as it creates a vacuum effect where others will take its place, repeating the cycle. We can assist to sterilise the cats and work with resident caregivers (if any) and yourself for an effective long term solution. 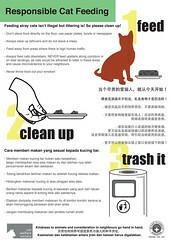 Feeding cats is an acceptable behaviour while littering is not. Feeders are advised to feed away from high human traffic on ground floor. They will need to clean up after feeding. NEA provides a 2-hr window within which feeders will need to clean up leftovers. A responsible feeder brings much benefits to the community. They ensure that the cats are sterilised and this is indicated by a tipped left ear. As such, they contribute towards an effective long term reduction of cat population. 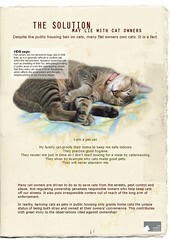 They also do not want to have to feed so many cats as they do this out of their own time and money. A well maintained colony is healthy, few in numbers and to many, the cats add joy to the neighbourhood. If you come across feeders who are not doing the right thing, start engaging them in a friendly manner or leave this Responsible Feeding Poster where their usual feeding spot is. Enlist the help of your local resident’s committee if required. Highlight unsterilised colonies to us. Why are the cats here and what is being done about it? The community cat population in HDB estates has been reduced by more than 70% since the 90s through a decade of intensive sterilisation effort. It is only recently that the Stray Cat Sterilisation Programme and its crucial government funding has been expanded islandwide to cover areas beyond HDB estates. This means more effort is being made to bring cat populations in industrial and commercial areas under control. A consistent effort will make a big difference to the cat population in these areas in a few short years. How you can help: Highlight unsterilised colonies to us so that the issue can receive attention. We have worked with condo management, government and commercial buildings, sometimes on a co-sharing basis to bring colonies under control. The situation can be turned around permanently very quickly when we work together. As cat ownership becomes more widespread and mainstream, our findings have shown that 90% of these owners are already adhering to responsible cat ownership guidelines. However, there are still a small minority of cat owners who are causing the common cat disamenities in our neighbourhoods by letting their pet cats roam in the corridors or feeding cats directly outside their units and on the upper floors. 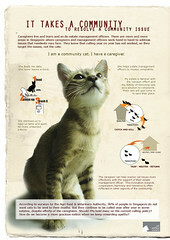 These roaming issues often get blamed on community cats. Efforts must be made to educate these owners so that their behaviours will not be repeated. In the past, the quick removal of the cat for culling only perpetuates an endless cycle of cruelty as the root of the issue is not addressed. The erroneous human behaviour then gets repeated with the next batch of cats. We see the need to address an issue at its source for an effective long term solution. How you can help: Identify the households that are perpetuating these behaviours and start engaging them in a friendly manner. Help give them a mediation advisory or other educational materials to help them make the right decision. Enlist the help of your local resident’s committee if required. Get in touch with us at [email protected] for more humane options to resolve your issue.